Until recently, people in Mongolia had to travel more than 1,000km (600 miles) across the Gobi desert to Beijing to get to their nearest record shop. But this year, a new specialist store opened in the capital, Ulan Bator. Batbold Bavuu began collecting records by accident 10 years ago, rescuing them from rubbish bins at the music college where he was a student. Those discs formed the basis of his collection and the inspiration for his new shop, Dund Gol Records. The business started off in the corner of a children's library, tucked away in a tiny area with tall, dusty windows. 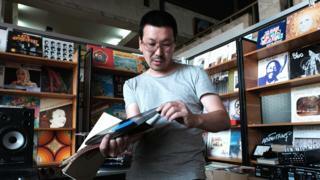 His mission: to make vinyl cool again in Mongolia. "It's not just what I do, it's who I am," says Batbold, who usually goes by his nickname, Boldoo. "The most important part is the music, it's a big part of my life, so that's why I'm doing this." His mother, who used to sing him Mongolian folk songs, first introduced him to music, and then in the early 1990s he got into hip hop. "What I liked most was hip hop's sampling culture. I like funk, soul, jazz music, and later I just got into everything… I'm not the typical collector, I collected very fast. I collected because I like to sample music, that's why I like every genre." Boldoo moved to London to study, took sound engineering courses, and then eventually began to write rap lyrics. He released a record with a Japanese artist in 2007, before returning to Ulan Bator to run a club and host underground parties. Now he's put his 3,000 records on sale - an eclectic mix that includes Cuban tracks, Yemeni Jewish music, hip hop, Edith Piaf, pop groups from Belarus and rare state-sponsored Mongolian rock bands. With possibly the largest record collection in the country, he has a wide selection of albums from the Soviet era - some that were officially released and others that were smuggled into the country, evading strict controls imposed by the Communist authorities. As far as he knows, this is the country's first specialist record store. During Mongolia's 65 years as a Soviet satellite, when it came under Moscow's influence, music was sold in book shops and department stores. Dund Gol which means Middle River, is nostalgically named after the river that flows though the city. Boldoo grew up nearby and spent his childhood fishing there, though as Ulan Bator expanded, water levels dropped and the fish have all but disappeared. Development has brought foreign visitors though. Boldoo has welcomed shoppers from Israel, South Africa, the US, Germany and Egypt who come to dig for forgotten musical treasures. Billy Macrae, a photographer from London, heard about Dund Gol from a Norwegian friend who introduced him to Boldoo via the shop's Facebook page. When Macrae walked into the store, some of the first things he noticed were the Bee Gees and Beatles albums. "It's quite unique in that these records have been sitting in someone's ger (yurt) for about 30 years, and some of them seem really well preserved," he says. "I think a lot of the particular copies would have been issued in the USSR and I don't think you'd find them in a shop in London for example." Now, rather than sifting through rubbish bins, Boldoo finds that vinyl comes to him. His foreign customers often post him records when they get home and sometimes local families call asking him to sell their discs in his shop. "Every Mongolian family used to have few records," he says. "It was very trendy during the 80s, but most of them played Frisbee with them." On one of the last days of summer, before the air turned thick with the smell of coal fires, Boldoo got a call from young man living in one of the slum districts, where close to 800,000 nomads have set up their traditional yurts. Between sips of milky Mongolian tea, he inspected 100 or so records and came away with music by Charles Aznavour and Elvis Presley, a rare set of flexible and colourful German 78s, a disc in the shape of a postcard and an album of African-American gospel music pressed in the Czech Republic in 1963. Boldoo suspects the collection once belonged to a Mongolian diplomat who acquired the music on trips abroad more than 25 years ago - someone in such a position would have been able to bring them into Mongolia undetected. Though his loyal customer base consists mostly of European and American visitors, Mongolians are also starting to take more notice. Baapii came to Dund Gol just to see a record player - she'd only ever seen them in films. "I was thinking, 'Why don't we have this in Mongolia? I want to see this too,'" she says while flicking through Beethoven records. "It's so nice to see it." She plans to come back another day to buy a turntable - Boldoo recently imported 10 to sell to his customers. The shop seems to be doing well and has already moved to a larger site a few blocks away from the children's library. Boldoo is now sharing a place with a delicatessen where he has more space to display the albums that were once confined to cardboard boxes. He is also cataloguing his collection in the hope of selling online too. "The good part is that I acquire a lot of knowledge," he says. "I learn languages because all these records have been pressed and written in different languages. I meet lots of interesting people with lots of stories. It's very profitable to meet like-minded people from all around the world to exchange knowledge and culture." This article was made possible through a fellowship from the International Reporting Project. German DJ, Frank Gossner, travels around Africa searching for old, unwanted and often mouldering LPs, gets them reissued and then plays them at his gigs around the world. He's found hoards of records in back rooms, "half-bombed government buildings" and abandoned warehouses. "During the rainy season it gets so humid and so wet that you have mould growth... and then everything gets dry again, brittle and it starts falling to dust... you're fanning all the dust and most dangerously the mould spores into your face and inhaling them and that can seriously make you ill, that's why I was running around with a dust mask."